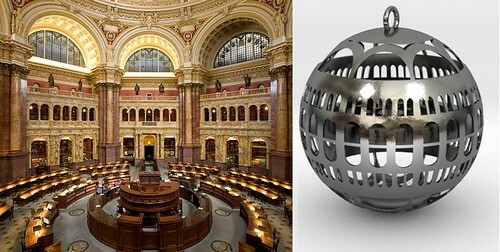 My latest 3D printing project is a Christmas Ornament inspired by the Library of Congress. It is currently one of the 20 Finalists in the White House 3D Printed Ornament Design challenge. Since the challenge was hosted by Instructables, all my step by step instructions of how to model the ornament in Blender (and the downloadable .STL file) can be found up at Instructables. Image on the left is by Carol M. Highsmith and in the Public Domain. The ornament can also be printed at Shapeways.